ARCHITECTURE: This diagram shows the basic architecture for WPF. Notice all the different media types (in yellow) that are handled by WPF: Vectors, Bitmaps, 3D, Audio and Video, Text and Effects! Second, notice how the animation capabilities of WPF spans across all the media types, allowing you to animate any kind of content. The WPF Composition Engine (in black) is one of the revolutionary features of WPF. This engine provides capability of having live content inside of another content. This means that you can have a 3D object rotating inside a Button control and furthermore you can have a video projected over the surface of the 3D object! This tree structure and nesting capability is available for all content and every control that WPF provides. WPF is not only about rich user interfaces but also about high fidelity information, connection and data. Controls, Layout and Databinding are just some of the examples of this power. The XPS format is a rich document definition that allows us to enjoy the best of WPF in a document. In summary, WPF represents an evolution in terms of richness, interactivity as well as information and data. Integration: Windows Presentation Foundation offers a unified API that spans the services identified in Table 1. Developers today are faced with a myriad choice of disparate technologies and APIs, depending on whether they are targeting 2D graphics (GDI or GDI+), user interface (USER32 or Windows Forms), media (DirectShow), or 3D (Direct3D or OpenGL). Windows Presentation Foundation provides a single model that is orthogonal across all these services and allows seamless integration of content within a single application. You can use the same constructs for animation, data binding and styling, regardless of whether you are targeting 2D, 3D or text content. Vector graphics. As described in the introduction, Windows Presentation Foundation takes full advantage of the powerful Graphical Processing Units that are part of modern PC systems. At its heart, the composition engine is vector-based, allowing for scaling of all output to match the resolution of a specific machine. The rendering architecture uses Direct3D for all output: on video cards that implement DirectX 7 or later in hardware, Windows Presentation Foundation renders output using the GPU wherever possible. In situations where hardware rendering cannot be used, software rendering is available as a fallback. Lastly, a floating-point logical pixel system and 32-bit ARGB color support provide a rich high-fidelity experience that anticipates future technology needs, such as high-DPI displays. Declarative programming. Windows Presentation Foundation introduces XAML (eXtensible Application Markup Language), an XML-based language for instantiating and populating nested object hierarchies. While XAML isn't exclusively tied to Windows Presentation Foundation, it is inherently suitable for tasks such as UI definition and construction. The design of XAML allows applications to parse and manipulate UI logic at run-time for dynamic workflow scenarios. Importantly, the XAML / code-behind model embodied in Windows Presentation Foundation allows designers and developers to work collaboratively on client application design and development, using tools such as Expression "Sparkle" as well as third-party specialist tools including ZAM 3D and Mobiform Aurora. Easy deployment. With support for both standalone applications and Web-browser applications, Windows Presentation Foundation offers the best of both deployment models. Web-browser applications run from within Internet Explorer, either occupying the entire window or within an inline frame. They offer the ease of deployment for which Web applications are famed, as well as operating within a partial trust sandbox that protects the client machine against malicious applications. Yet they can still take advantage of the local client hardware and use 3D and media services for the richest Web experience available today. On the other hand, standalone applications are locally installed via ClickOnce or MSI technologies and offer full access to the underlying platform. Document lifecycle. Windows Presentation Foundation introduces a new set of document and print technologies. Applications that need to persist data to a local store can use the Open Packaging Conventions, a ZIP-based packaging convention shared with Office 12 that supports core properties and custom metadata, digital signatures and rights management functionality. For applications that want to share documents for collaboration across multiple machines, even without the application installed, the XML Paper Specification allows visuals to be fixed in a printable, portable format. PresentationFramework.dll. Holds the top-level WPF types, windows, panels, and other types of controls. PresentationCore.dll. This holds base types, such as UIElement and Visual, from which all shapes and controls derive. milcore.dll. 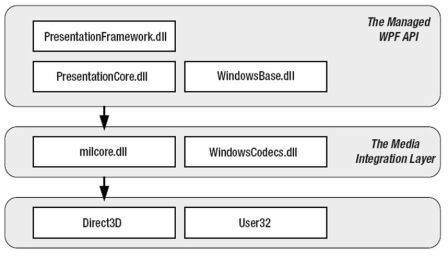 core of the WPF rendering system and the foundation of the Media Integration Layer (MIL). Its composition engine translates visual elements into the triangle and textures that Direct3D expects. Direct3D. Contains API to for the graphics in a WPF application are rendered. User32. This is used to determine what program gets what real estate.